This blog is dedicated to writing desks of all types, including small writing desks, large writing desks, antique writing desks, modern writing desks, and all different types of writing desks available. There are actually many different designs when it comes to Victorian writing desks. 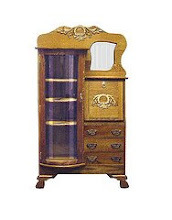 This term simply refers to any type of desk that was made during the reign of Queen Victoria in England, and so these pieces of furniture can range from fancy antique roll top desks or secretary style desks to very basic and boring desk designs that were the bare minimum of design and were simply meant to be functional. The variation can be incredible, and for that reason this is not the most descriptive term for figuring out what a piece of furniture looks like. On the other hand, many of these writing desks were built from oak or other hardwoods that have had the ability to last decades or even centuries if properly taken care of. Because of this, many antique models of these wood writing desks can last for a long time and remain in surprisingly good shape even after the passage of time. And the ones that were decorative instead of basic, they are absolutely beautiful pieces that stand out, such as the one in the picture to the left. The Victorian Era lasted from around 1830 to 1900, and this covers a wide variety of styles, crafts, designs, and obviously the desks that were made for the common workers looked a lot different than the ones made for merchants or the wealthy. because of this writing desks of Victorian times are very different with a variety that is hard to see at any other time under one particular name or title. Because of this, there might be too much variety to easily stereotype them, but you can bet that these pieces of office furniture will be high quality. A picture of an old school writing desk. I am a freelance writer with a wide array of interests and want to provide blogs with great helpful information.